The most northern, the most southern, the wildest, the coldest and the most classic surf contest on the planet. Five exotic, extreme and unique locations. Tasmania, Scotland, South Africa, Nova Scotia and California. Grab your wetsuit and prepare to surf some of the most secluded and pristine beaches of your life. 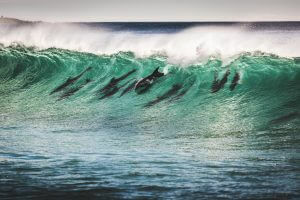 Tasmania suits all difficulty levels, from the awe-inspiring swells of Shipstern Bluffs, to the beginner-friendly Clifton Beach where you can take lessons at a local surfing school. Image thanks to Adam Gibson. Many of the most popular sites can only be reached through trekking through World Heritage areas, adding to the adventure of the experience. Be ready to enjoy beautiful waves that were generated thousands of kilometres away in the Southern Ocean. Tasmania lies in the path of The Roaring Forties, strong westerly winds found in the Southern Hemisphere between the latitudes of 40 and 50 degrees. Due to this intense placement, many good surf options exist across the island, but conditions depend highly on the swell, wind, and tidal conditions. Image thanks to Tourism Tasmania & O'Neill Coldwater Classic. Late summer offers the warmest and most pleasing time of year to surf in Tasmania. However, the best conditions and biggest swells are to be found in autumn and winter. 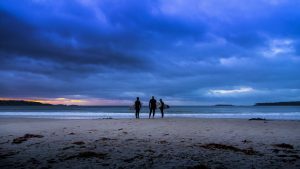 Featuring plenty of great surf spots, this area of Tasmania is popular for holiday-goers and is known for milder weather. Secluded surf spots are not hard to come by and you’ll find yourself basking in paradise at coastal surf towns such as Bicheno and Scamander. The best waves on this coast are in the north due to the shelter provided by Maria Island and the Freycinet Peninsula, although some good waves can be found in Marion Bay, just a 40 min drive east of Hobart. The town of St. Helens has some good spots, as does Eaglehawk Neck. The east coast is also the location of one of the big-wave surfer spots, Eddystone Rock, but it remains mostly a secret due to its remote location and difficulty level. Image thanks to Tourism Tasmania & O'Neill Coldwater Classic. The best spots in the south are plentiful and easily reachable from Hobart. This area is the most heavily surfed in Tasmania and provides the most options. Clifton Beach is a 45-minute drive south-east of Hobart where beginners can take lessons at surf school. Eaglehawk Neck, just 15 minutes further, has superb waves when the swell is south-easterly and the wind westerly. Another option to consider is Bruny Island’s east and south coasts which receive cold, Antarctic swells. Bruny can be reached by ferry from Kettering, which is 40 minutes drive south of Hobart. If you’d like to hit Australia’s southernmost surf beach, then swing by Cloudy Bay and surf it in a southerly swell and a northerly wind. It can be reached via a 7-kilometre walk through World Heritage wilderness. Image thanks to Tourism Tasmania and Rob Burnett. Not to be forgotten, however, is the one and only Shipstern Bluff. This spot has well-earned its reputation for dangerous, heart-pumping conditions. With gigantic swells, sharks circulating, and a shallow reef, this site is for professionals only and is visited by the world’s best big-wave surfers. Monster waves require a strong south-westerly swell. It is a trek to get to but can be worth it just for the views and photographs, if not for daring the waves. Drive to the Cape Raoul walking track car park in Tasman National Park. Follow the trail for 2 hours through thick bush to Raoul Bay; Shipstern Bluff is below the cliff to the right. Being the least explored coastal area of Tasmania, there are still several known sites in this region which draw surfers from around the world. The 2 most popular sites find themselves at opposite ends. South Cape Bay to the far south, and Marrawah in the far northwest. Image thanks to Tourism Tasmania & O'Neill Coldwater Classic. Marrawah is home to Tasmania's premier surf event, the West Coast Classic. 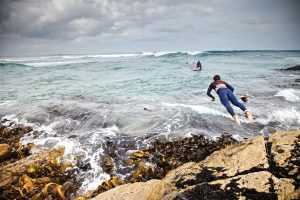 The 3 beaches - Ann Bay, Mawson Bay, and Green Point - have long rides when the swell is westerly and the wind offshore. The local surf community is friendly and can help point you in the right direction. Take note that some of the best surf is on private land and take care to leave the beach as pristine as you found it. Marrawah is a 3.5-hour drive north-west of Launceston. 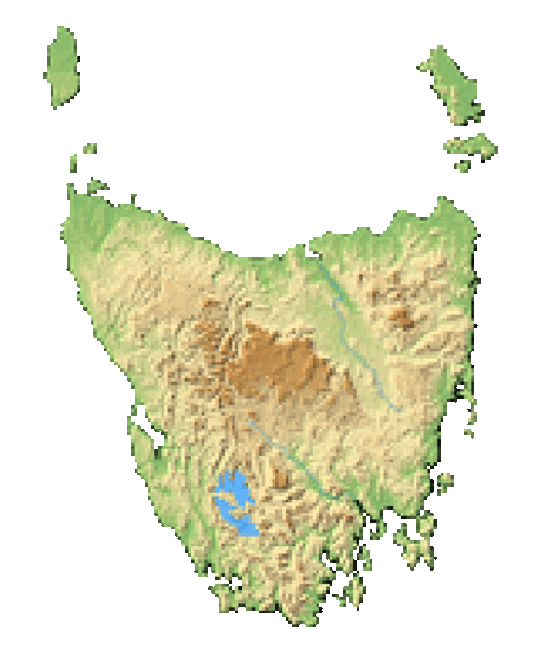 In the far south, South Cape Bay can only be reached via a 5 hour hike from Cockle Creek, which is a 2 hr drive southwest of Hobart. It’s a gorgeous beach that gets massive waves on a southerly swell. Although the waves here are generally not as big as other areas of the island, exceptions such as the mouth of the Mersey River in Devonport do exist and are worth exploring. However, the north’s best surf isn’t to be found on mainland Tasmania, but rather on King Island. With diverse coastline there’s often great conditions somewhere, and on the east coast you can find Martha Lavinia, ranked by Tracks magazine as Australia’s best beach break. Depending on the swell and the wind you may find a unique wave there that breaks both left and right. On the island’s west coast look for British Admiral beach or Fitzmaurice Bay. Image thanks to Tourism Tasmania & O'Neill Coldwater Classic. Shipsterns Bluff - Australia’s heaviest wave and should not be entertained by the amateur or faint of heart. Bruny - Bruny's east and south coasts are where to be. Bicheno - Popular surf town with warmer conditions. King Island - The north’s best surf. Shipsterns Bluff is one of the wildest and most dangerous location in the world for surfing.